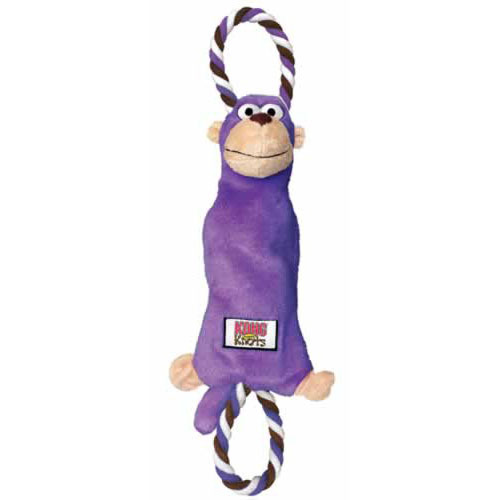 The KONG Tugger Knots Small/Medium size Monkey is fun, interactive multi-purpose dog toys, with rope handles for tugging, plush body for shaking and snuggling, plus a squeaker for extra excitement. Tugger Knots’ unique design features knotted ropes inside the Monkey, which provide a variety of chewing resistances for a realistic feel that dogs love. The ropes are also looped together to absorb tugging stress, leaving the plush toy Frog intact after even the most strenuous tug sessions. The rope is wrapped with plush characters made from double-ply material for extra durability. KONG Tugger Knots dog toys are available in two sizes (Small/Medium and Medium/Large) and come in four cute characters: Monkey, Frog, Lion and Moose.